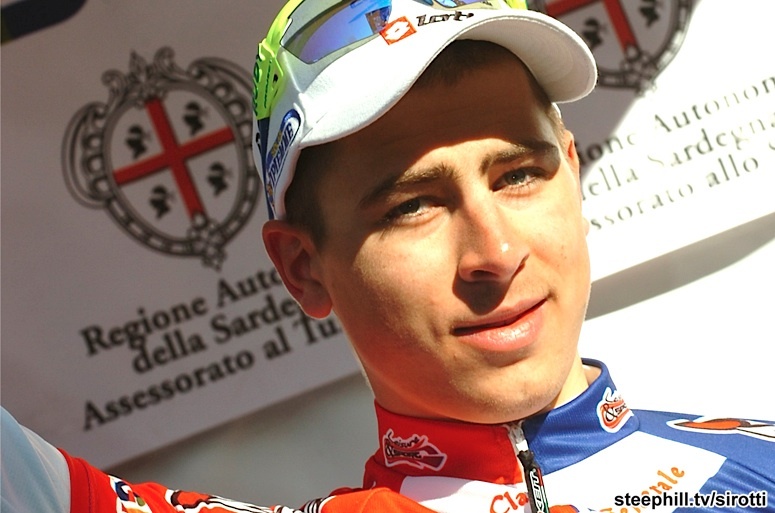 2  José Serpa Perez (Androni Giocattoli)       +  3"
3  Damiano Cunego (Lampre Isd)                 +  8"
4  Peter Sagan (Liquigas Cannondale)           + 11"
5  Emanuele Sella (Androni Giocattoli)         + 14"
7  Stefano Pirazzi (Colnago Csf Inox)          + 21"
1  Peter Sagan (Liquigas Cannondale)      22h28'24"
2  José Serpa Perez (Androni Giocattoli)       + 3"
3  Damiano Cunego (Lampre Isd)                 + 7"
February 25 update: The U.S. national road champion and RadioShack's, Ben King tweeted post stage 4, "the first climb hurt so bad it was hard to enjoy the following hundred miles. The ProTour is fast. Gonna get old man strength out of this race!". And stage 5 will have the toughest finish yet, providing Damiano Cunego a chance to win his second stage, possibly trumping Peter Sagan's three stage wins by winning the overall on the final day as well. 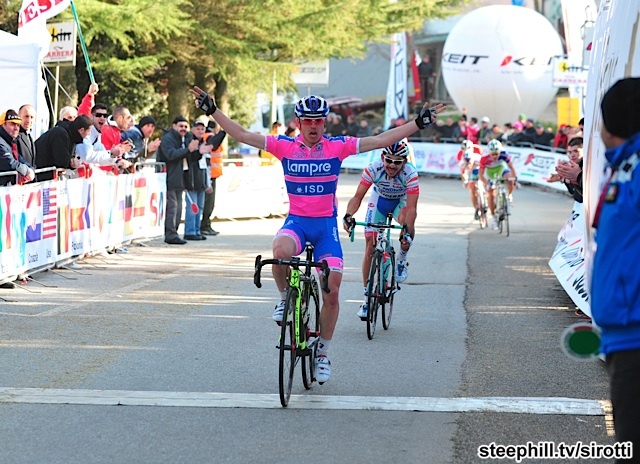 2  Damiano Cunego (Lampre Isd)              + 14"
3  José Serpa Perez (Androni Giocattoli     + 16"
4  Emanuele Sella (Androni Giocattoli       + 28"
5  Ben Hermans (Team Radioshak              + 32"
6  Michele Scarponi (Lampre Isd             + 38"
7  Eros Capecchi (Liquigas Cannondale       + 38"
8  Pavel Brutt (Katusha Team                + 42"
9  Robert Kiserlovski (Astana               + 43"
10 Mauro Santambrogio (BMC Racing           + 44"
2  Damiano Cunego (Lampre Isd)             +  4"
3  José Serpa Perez (Androni Giocattoli)   +  6"
4  Emanuele Sella (Androni Giocattoli)     + 17"
5  Ben Hermans (Team Radioshack)           + 22"
6  Michele Scarponi (Lampre Isd)           + 28"
7  Eros Capecchi (Liquigas Cannondale)     + 29"
8  Pavel Brutt (Katusha Team)              + 32"
9  Robert Kiserlovski (Astana)             + 34"
10 Mauro Santambrogio (BMC Racing)         + 39"
An early break usually forms on the hills outside Olbia, the traditional start host for the Giro di Sardegna; however, this year we'll first head north where it is flat instead of crossing the hilly interior on the first day. The weather is forecasted to be similar to what you see in this picture. February 21 update: Stage 1 is an easy one profile-wise, it being the flattest of all the stages, but the course map looks like spaghetti -- lots of chances to short-circuit this stage. 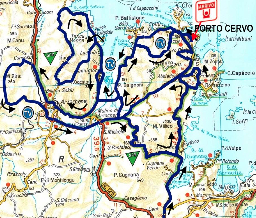 Normally, we see some hills after leaving the traditional start host, Olbia, but this year instead of heading over the hilly interior to the west, we'll head north and meander around the coastal inlets for 138 km before an expected sprint finish in Porto Cervo. 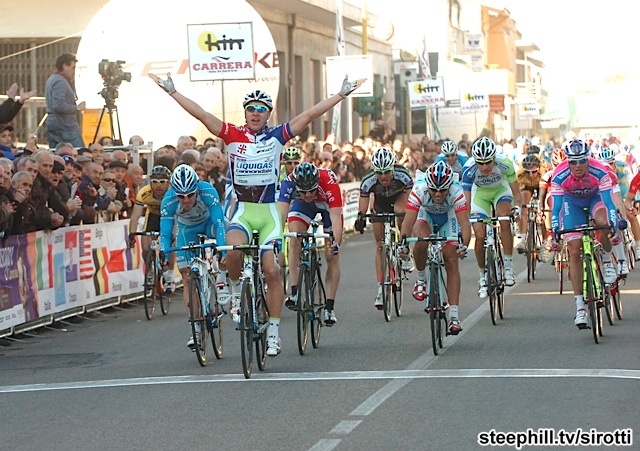 Veterans Alessandro PETACCHI and Robbie MCEWEN will be in tough against some good young sprinters. 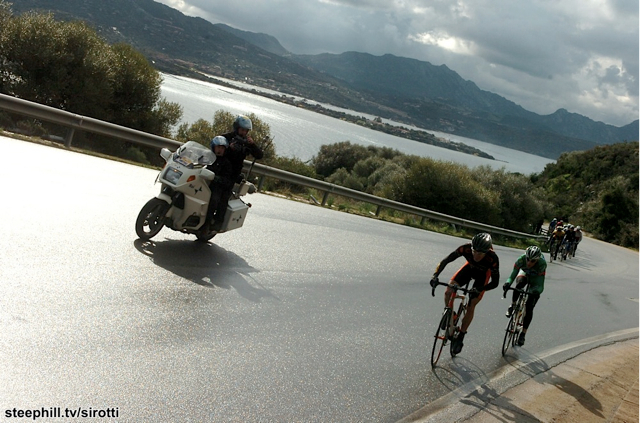 Giro di Sardegna twitter group Updates on live coverage, results, photos and video will be posted here as they become available. 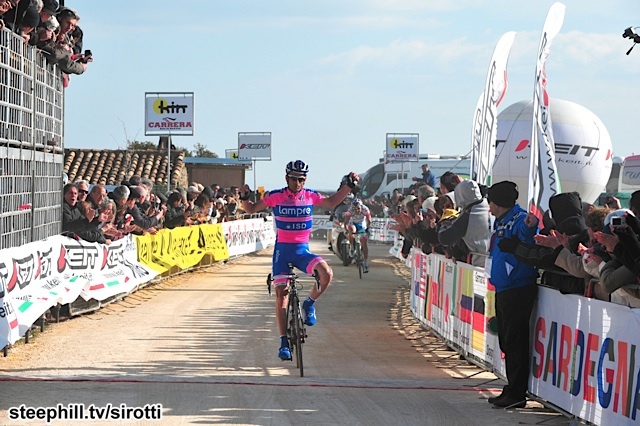 February 15 update: Lampre's Alessandro Petacchi will be riding the Giro di Sardegna afterall. 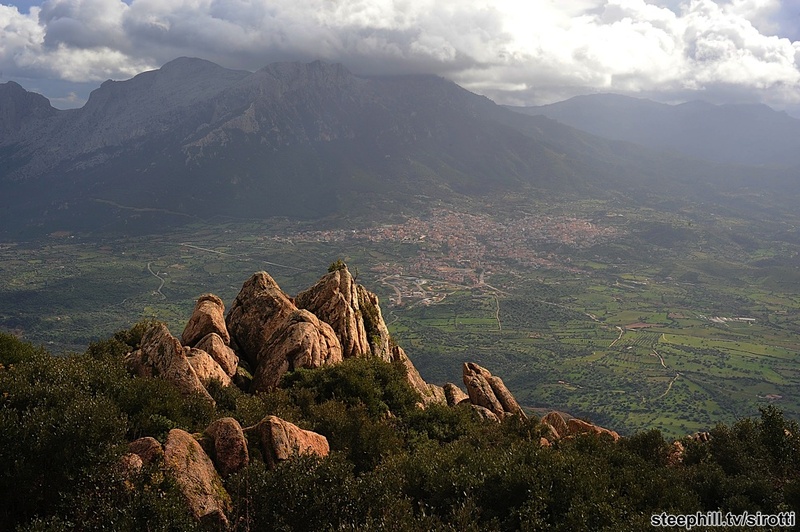 February 10 update: Giro di Sardegna is a five day stage race (2.1) that takes place on the second-largest island in the Mediterranean Sea (after Sicily). 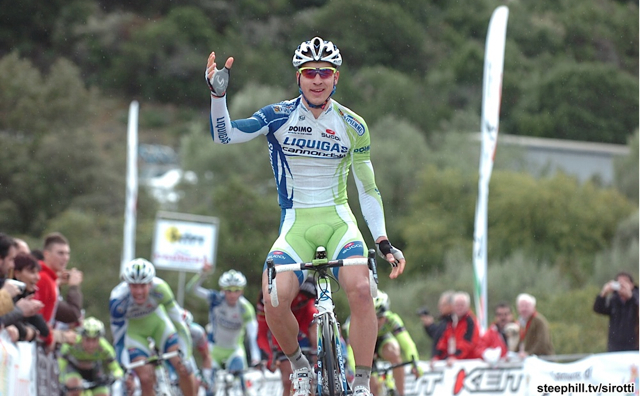 The island of Sardegna (English: Sardinia), you may recall, hosted the first three stages of the 2007 Giro d'Italia. 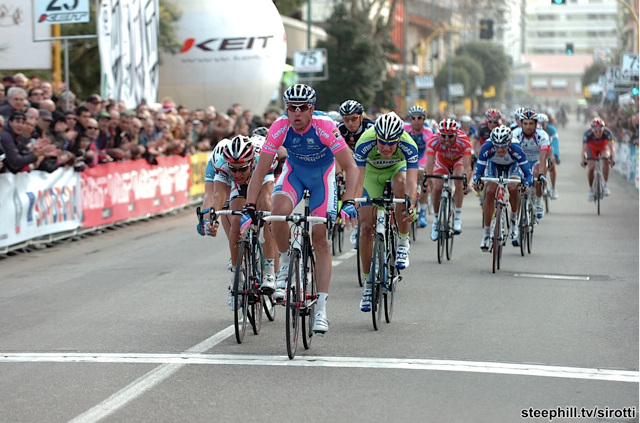 After an eleven year absence, the Giro di Sardegna returned in 2009; it was first held in 1958. 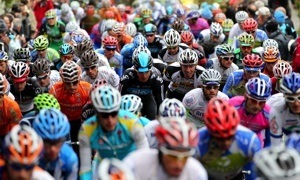 This hilly, scenic race is part of the UCI Europe Tour. Like other five day stage races at this time of year, the race is hilly, but not too difficult. 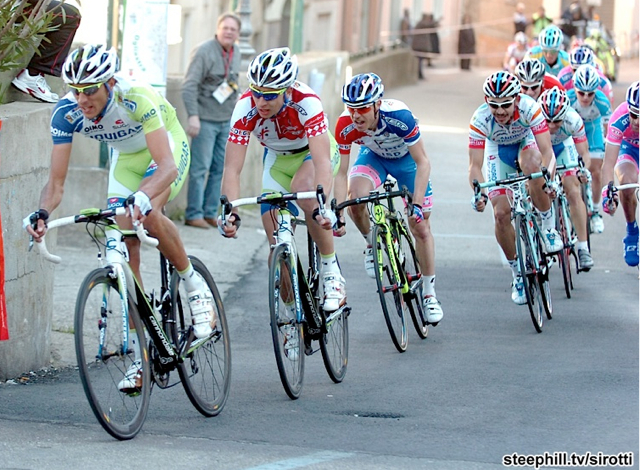 However, like last year, stage two (the Queen stage) finishes part way up Monte Ortobene (photo above) to 922m el. Stage 3 (last 15 km profile) and stage 5 (last 9 km profile) will also have uphill power finishes which will suit Stefano Garzelli, Peter Sagan, Enrico Gasparotto, Danilo di Luca, Jose Serpa, Damiano Cunego and Michele Scarponi. 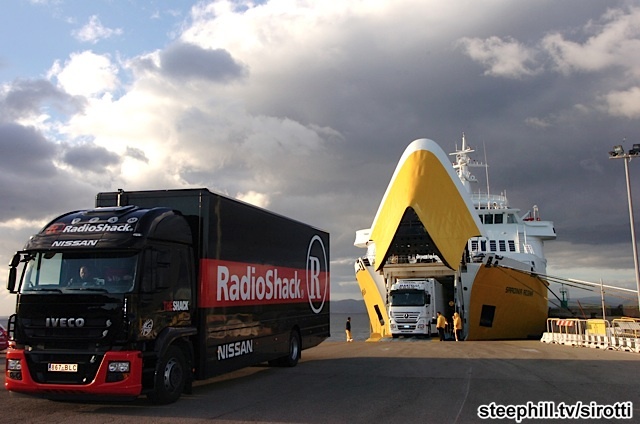 February 5 update: The 2011 route details will be announced Thursday, February 10th at a press conference in Cagliari, the headquarters of Sardinia Tourism. These eleven teams are expected to partake: Liquigas-Cannondale, Lampre-ISD, Pro Team Astana, BMC Racing Team, Team Katusha, Team Radioshack, Acqua e Sapone, Colnago CSF Inox, Miche-Guerciotti Spidertech and the Great Britain National Team. Last year, sixteen teams participated so expect five or so more teams to be added. February 4 update: Ivan Basso, Vincenzo Nibali, Maxim Iglinskiy, Alessandro Ballan, Michele Scarponi and Danilo Di Luca are expected to partake.